Rodriguez co-founded Vergence Labs, the company behind the glasses, in 2011 with Erick Miller. Rodriguez said that he spent his entire senior year working on the technology behind the eyeglasses, quitting an internship at Facebook to devote more time to his new company. Epiphany Eyewear offers a general-purpose computer that can share photos on social media sites and live stream video on Facebook, as well as sunglass lenses that can be turned on and off with a simple button. 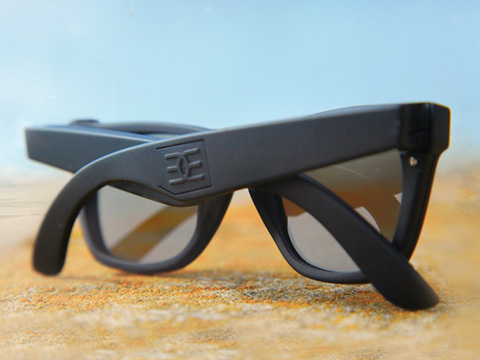 According to Rodriguez, Epiphany Eyewear differs from Google Glass in the product’s subtle nature. David Meisenholder M.S. ’13, a member of the Vergence Labs team, said that the glasses’ style is an integral aspect of the product. “We’re hoping to keep hitting the style on the head, making it a real fashion product rather than a consumer electronic,” Meisenholder said. Eric Smalls ’16, an intern with Vergence Labs who helped incorporate robotics into the glasses, identified a different corporate philosophy from that encountered at Google. “The vision of the team is very different from Google Glass. It’s definitely more personal and focused on the users,” Small said. While the Vergence Labs team expressed optimism that the glasses will offer a viable alternative to Google Glass, critics have contended that Epiphany Eyewear offers limited capabilities, citing the lack of a display to watch recorded videos and the omission of more advanced features like the ability to access Google Apps. However, the team said that they plan on releasing annual updates to the glasses, adding new components like the ability to incorporate prescriptions and, eventually, to program the glasses to allow students to take notes or record audio of a lecture or allow a golfer to watch a playback of his swing from a friend’s pair of glasses. “I think there’s great potential in the displays we’re researching to absolutely erase the lines between virtual reality and real reality,” Rodriguez said. The glasses are currently available for pre-order, with Rodriguez estimating that they will be ready for purchase by the end of summer 2013. Google Glass is expected to be made available to the public in late 2013. The Vergence Labs team emphasized Stanford’s influence on the glasses’ development, with Rodriguez noting that the Stanford Design Program’s “strong focus on thinking outside of the box” played a large role in the product’s design. Smalls agreed that Stanford connections have been an integral part of the company’s success. “[The company’s] relationship with Stanford is very important because it brings people to the team who are motivated and excited about working on really cool things,” Smalls said.